Vest-Agder county is in the southwestern part of Agder and extends inland from the southeastern coast of Norway. 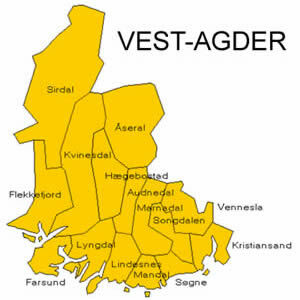 The population of Vest-Agder is 160,127 with over half of the population living in the capital city of Kristiansand. Kristiansand is one of the main ferry ports for crossings to Denmark and England. The name comes from the Danish king who founded the city in the 1600's. Click on a location below to find Vest-Agder hotels, Inns, hostels and other lodging.